The bio of Daniel Barriball. | Launceston Then! Daniel was born in 1848 to Charles and Mary Barriball at Werrington. His father was an Agricultural Labourer And in 1861 the family were living at Down Cottage, Werrington. On leaving school Daniel went to work as a Footman for Mr. Edward Coode, Landowner and Magistrate at Polapit Tamar. In 1872 he married Catherine Adams of Salcombe, Devon at Plymouth. They had three sons Charles b. 1873, William b. 1875 and Ernest b. 1877. 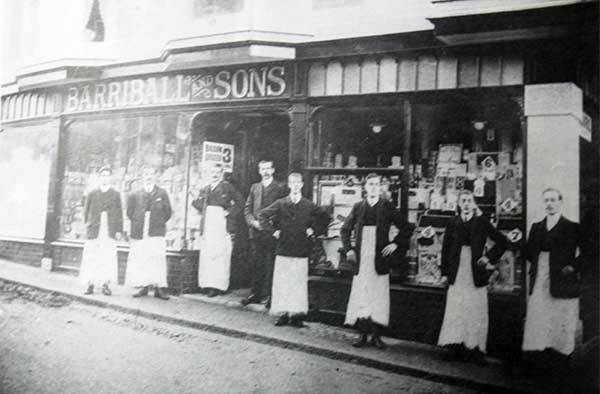 In 1874 Daniel began a grocery business working out of premises in Southgate place at the junction of Angel hill. Before motorised transport Barriball’s used to keep up to ten horses, and with horse drawn transport used to deliver to Tintagel and back in one day, starting at four am., with the first feed at the Wilsey Down Hotel. At one time they employed a staff of thirty hands. In 1881 Daniel was employing his two brothers John and James as Grocers apprentices and with his three sons the family were living above the shop in Southgate place. By 1901 Daniel’s business had expanded with a shop opening in Church street. Two of his sons William and Ernest had also joined him in the business with his eldest Charles, becoming a Methodist Minister. Daniel and Catherine had also moved to reside at the Walk. He handed control of the business to his sons who in 1909 had the Southgate premises completely rebuilt to plans by Otho B. Peter. After the rebuilding of the stores, the firm gave a ‘celebration’ dinner to ‘christen’ their new building, and Mr Edwin Davey responded to the toast to the staff given by Mr John Barriball, brother of the founder. The dinner was held in the Working Lad’s Institute (Brotherhood Hall). Proposing “The Firm”, the Reverend JJ Layland recalled that thirty five years earlier, Mr Barriball had only one apprentice, but now the firm employed 20 hands. Mr Edwin Davey, of Daws House, completed 50 years service before retiring, having been apprenticed to Mr Daniel Barriball. Daniel passed away in 1920. 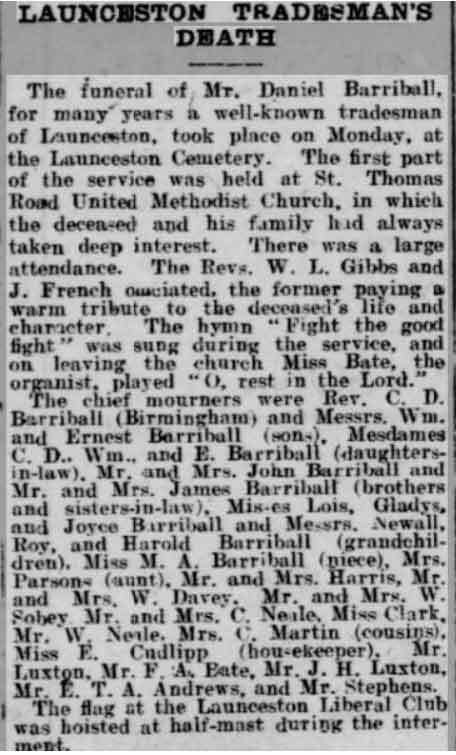 His funeral service was held at the St. Thomas United Methodist Church with the internment at Launceston Cemetery.